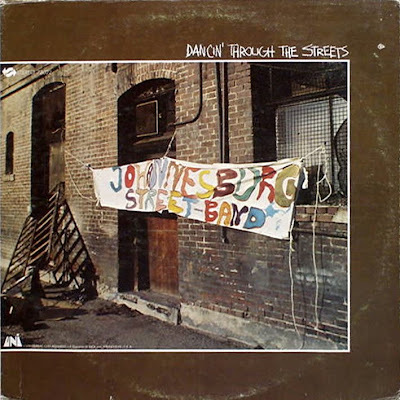 As Doug Payne notes at his authoritative Masekela discography Dancin' in the Streets is "A Hugh Masekela album in everything but name...credited to the non-existent "Johannesburg Street Band". 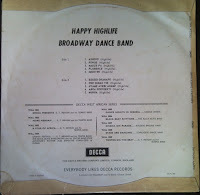 It is an extremely obscure album of hi-lite jive, or African jazz, that's unlikely to ever appear on CD. Masekela recorded the majority of the album in Los Angeles in January 1968, a couple of months before laying down his number one hit "Grazing in the Grass," with several members of his band at the time (Bruce Langhorne, Al Abreau and Henry Franklin) and Wayne Henderson and Wilton Felder of the Jazz Crusaders. 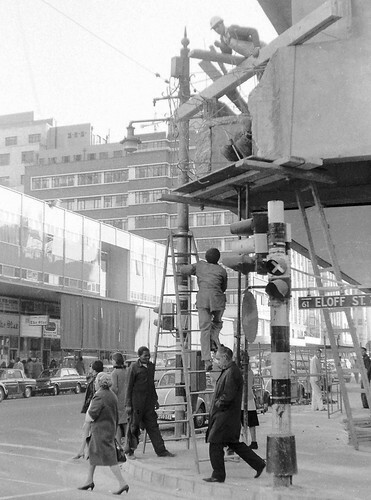 Like Africa '68, another Masekela album not credited to Masekela, recorded and released on UNI around the same time as this album, Dancin' Through The Streets catches a side of Masekela's personality - or his past - that wasn't exactly to be heard on the more commercial albums released at the time under his own name. 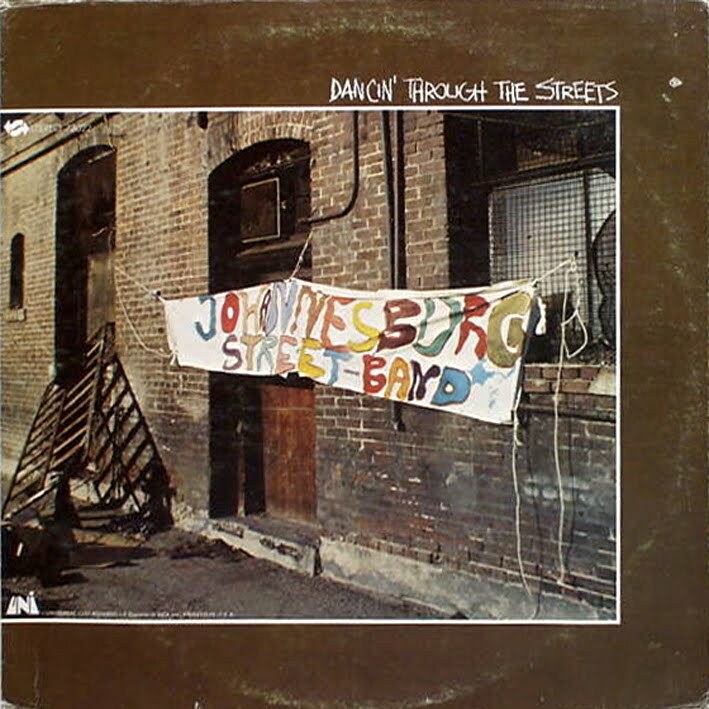 Oddly, this record gives no musician credits whatsoever other than what Masekela hints at on his sleeve notes, leading one to suspect that the musicians performing the music are very much in Johannesburg, prisoners of Apartheid's terrifying régime." 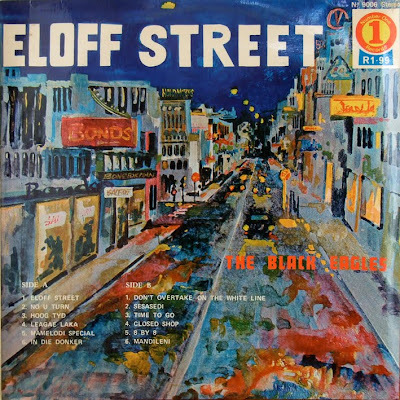 Produced by Hugh Masekela and Stewart Levine. 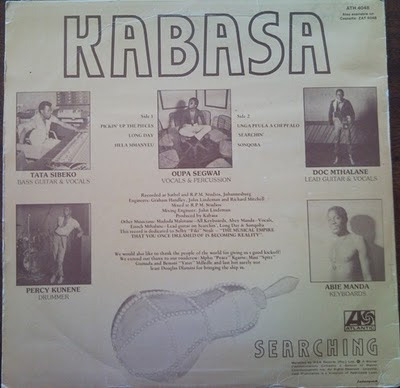 Looking at Matt’s Malombo discography here, it seems that today’s offering makes up a complete list of Malombo either available commercially or shared on the blogosphere. 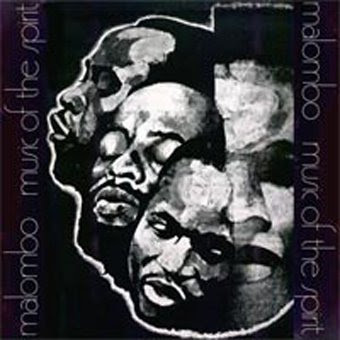 Music of the Spirit (1971) shows beautiful growth in the range and depth of the Malombo that recorded without Philip Thabane. 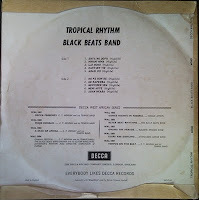 This recording was also a venture and risk taken by David Marks of Third Ear who pressed only one hundred copies. He reports that he only managed to sell fifty copies in twenty five years. Read more here. Third Ear did want to re-release this album a while ago, but it seems that this has not happened. 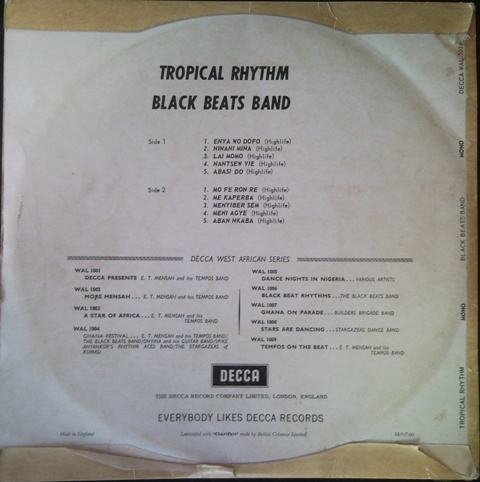 David, if you get to read this, and if you do re-release this fine recording – ElectricJive will immediately assist you and champion its sales. Until then, we humbly share this gem in the hope that it whets appetites and motivation for a possible re-release. 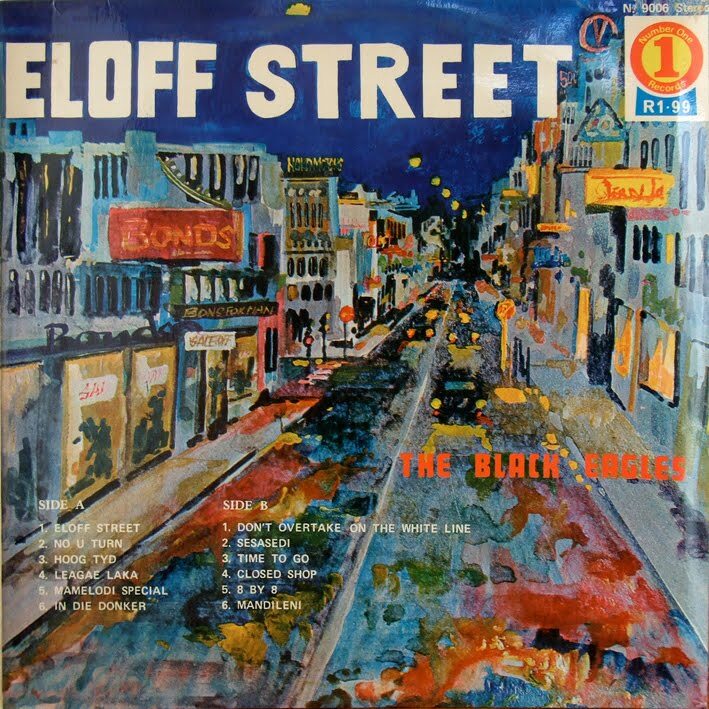 A small Sunday diversion from normal ElectricJive programming again – but then, Ghana's Black Stars will soon be wowing the crowds at the World Cup in South Africa, and this music just echoes South African jazz of the 50s in its pre-independence African swing-infected big band arrangements with luxurious brass and unhurried infectious rhythm. 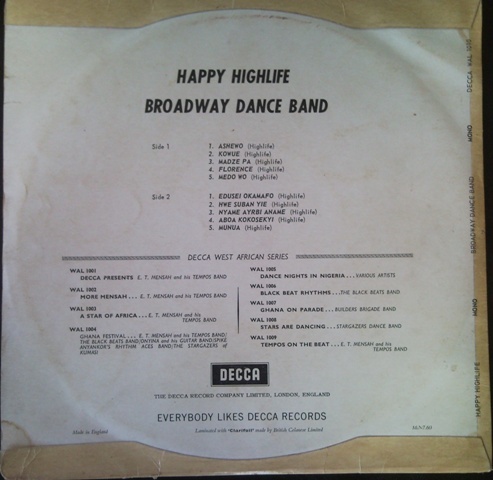 These Decca 10 inch LPs record something Sully Muntari and Michael Essien’s parents might well remember – highlife classics of the 1950s. 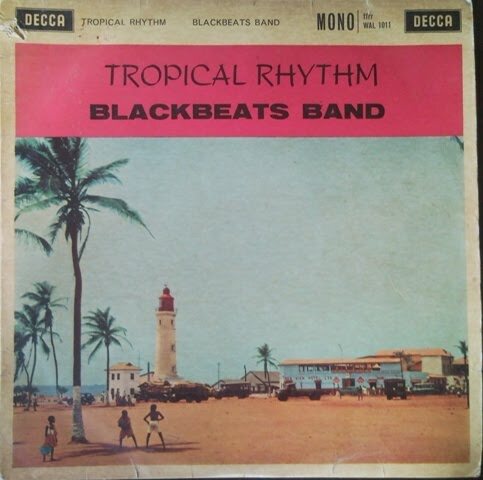 The Black Beats were re-issued on CD by RertoAfric – but that too is now out of print. If you have an hour or so spare on a Sunday afternoon, this music will set a perfect upbeat but relaxed tone. And watch out for Ghana at the World Cup! 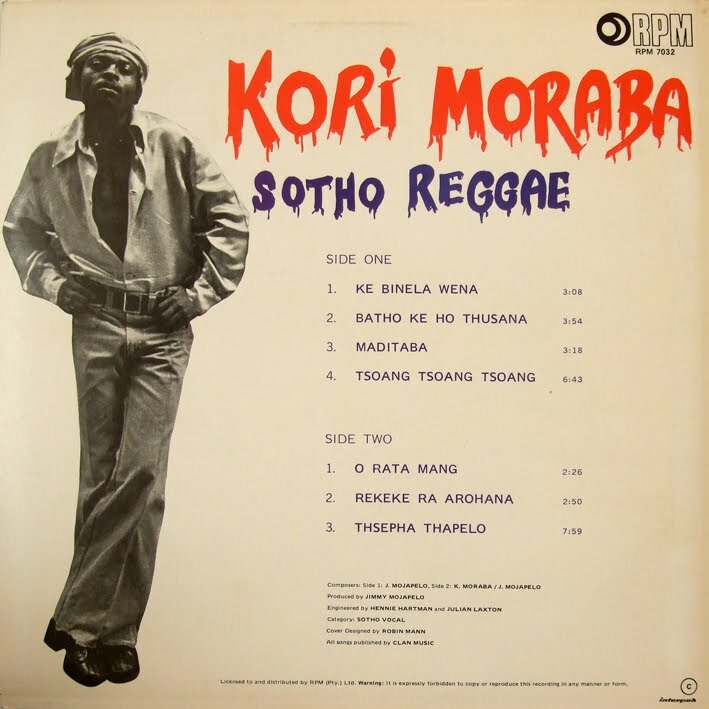 It is surprising how many South African musicians were great admirers of the likes of Jimi Hendrix, Janis Joplin and so on. Leading light in Kabasa, Robert “Doc” Mthalane was at times called South Africa’s Jimi Hendrix. Mthalane is revered among Busi Mhlongo fans as being the master guitarist and writer of most of the songs on her stunning debut album “Babemu” and beyond through the mid-nineties. Like Mhlongo’s music (read a recent post by Bongani Madondo on Busi here) today’s offering from 1981 draws on and fuses a wide range of styles – from maskanda and traditional Zulu, through to psychedelic rock, with a little bit of jazz and funk in-between. 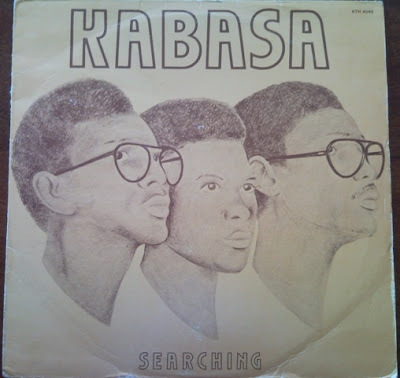 Close your eyes and hear echoes of Ray Phiri’s Stimela (in the two opening tracks), while half-way through my favourite track “Searchin” you could swear you can hear David Gilmour ex of Pink Floyd doing a solo guest spot. Just before he died of Tuberculosis in 1998, Mthalane led a London recording of a collaborative album “Respect” with Madala Kunene, Mabi Thobejane and Brice Wassy. He died before it was completed. The last track “Song for Doc” is sung by Busi Mhlongo in a dedication and tribute to Mthalane. Sorry folks, another recording that is out of print. Doc Mthalane’s son, Dan, leads an emerging group calling themselves “The Zulu Rock Band”, who, at the request of Busi Mhlongo, opened a performance of hers at the Rainbow Restaurant in September 2009. 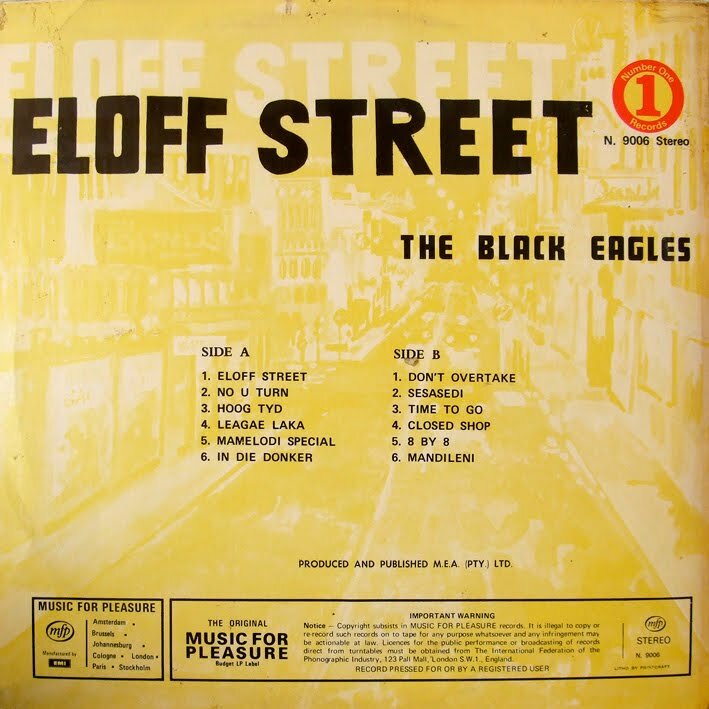 Thanks Koos for your generous gift of this vinyl! Engineers: Graham Handley, John Lindeman, and Richard Mitchell. Other musicians: Madoda Malotane – All Keyboards; Enoch Mtalane, Lead Guitar on Searchin, Long Day and Sonqoba. 6. Sonqoba (T. Sibeko / D. Mthalane). 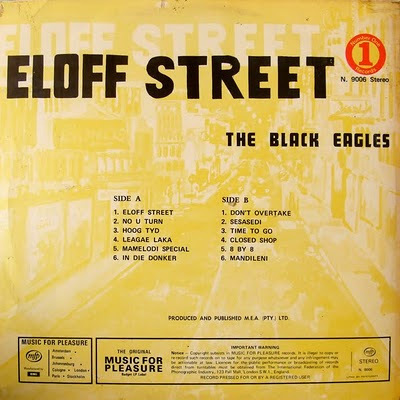 Today another classic straight ahead instrumental jive LP, this time from the group the Black Eagles and issued in the early seventies on the Number One label. 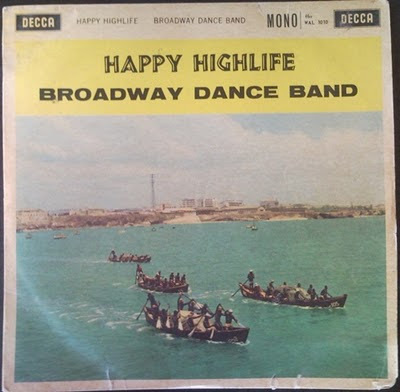 Back when we posted the Dread Warriors LP we were pretty certain that it was the first reggae LP recorded in South Africa (excluding the lame Kevin Kruger Kariba LPs from the early '80s recutting Marley tunes into a Stars-on-45 type medley). Well we just keep uncovering more. This LP recorded by Kori Moraba entitled Sotho Reggae was issued in 1977. 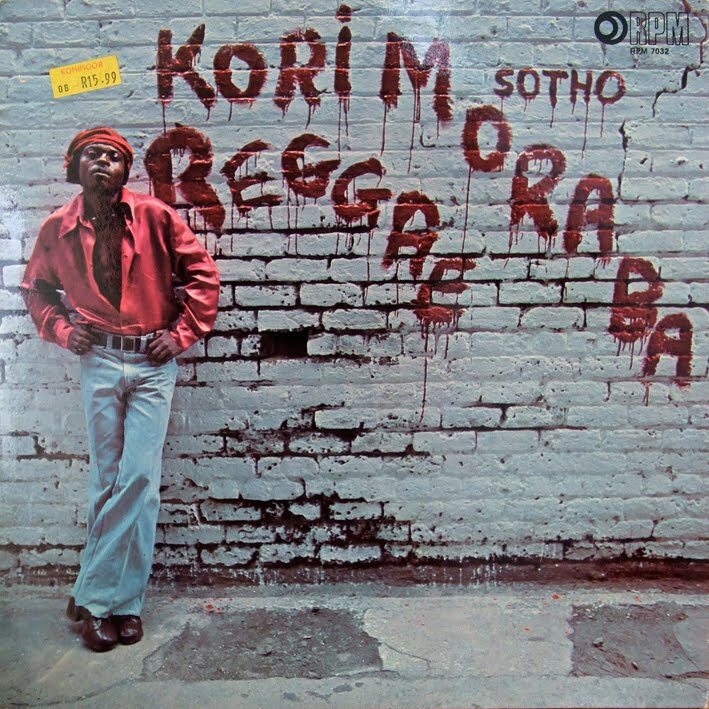 Whilst the Dread Warriors were consciously rasta Kori looks like he may have stepped out as the East Rand's answer to John Travolta's Tony Manero from Saturday Night Fever.